Unité de production AV permettant de facilement créer du contenu AV dans des situations où le nombre d'opérateurs est limité, par exemple pour la production d'événements sportifs universitaires, de diffusions en direct et de visioconférences. Les formats de sortie pris en charge incluent les formats 1080/59.94p et 50p. Une fonction de conversion croisée (entre 1080 et 720) est également disponible. L'AV-HLC100 allie des fonctions de mélangeur 1ME, de contrôleur caméra PTZ et de mélangeur audio dans un seul appareil pour permettre à une seule personne de tout contrôler, des prises de vue avec la caméra PTZ au streaming du flux. Les nouveaux packs, incluent les mélangeurs AV-HLC100, sont disponibles pour vous offrir un centre de production de haute qualité, fiable et ergonomique avec nos deux caméras PTZ NDIIHX, AW-HN38 ou AW-40. Unleash your creativity with the AV-HLC100 Live Production Center. Professionally capturing, producing and streaming live content has been made easy for everyone! 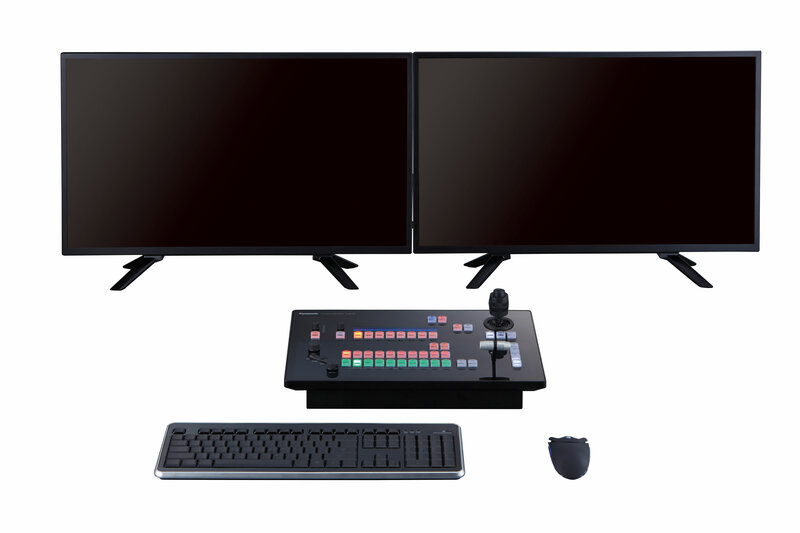 The AV-HLC100 Live Production Center is an AV production unit that enables you to easily create multimedia in situations where there are a limited number of operators available, such as university sports, live streaming shows, and conference video production. 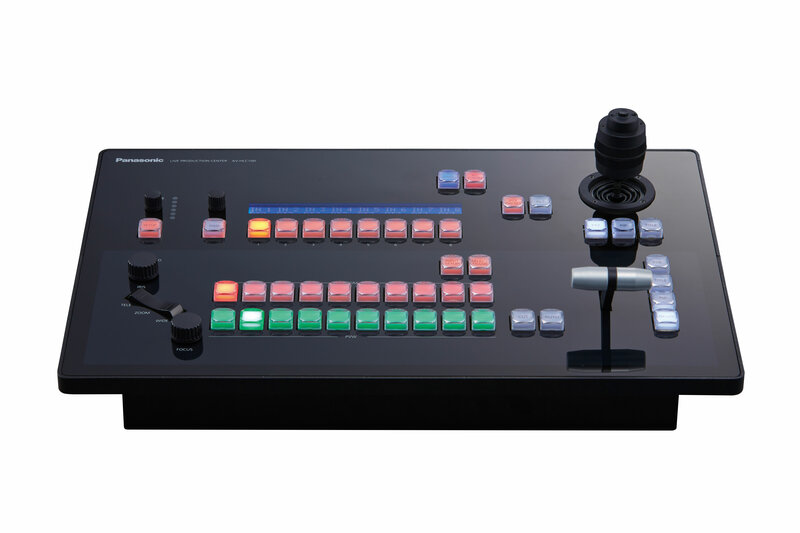 Combining a 1ME switcher with a PTZ camera controller and adding audio mixer functions to a single device, the AV-HLC100 makes it possible for one person to operate everything from a single PTZ camera to an entire multi-cam streaming transmission. 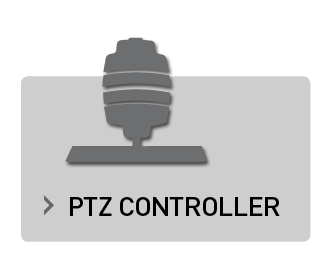 For PTZ camera operation, the connection and settings can be easily done using the Easy IP connection function, and pan, tilt, zoom, and focus operations can be performed with one hand using the large joystick. 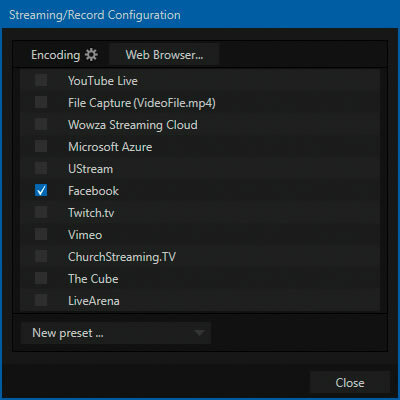 Stream to a variety of sources, including YouTube, Facebook Live, Twitch, ChurchStreaming.tv, LiveStream, Periscope or a custom RTMP destination without the need for an external encoder. 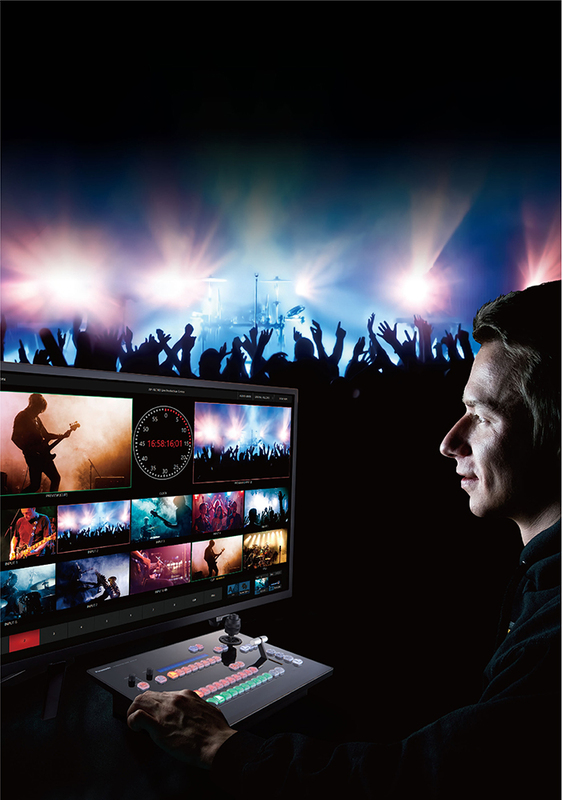 The AV-HLC100 supports RTMP connections, enabling PGM output to be directly uploaded to livestreaming services, while also allowing for recording during the stream. Streaming/recording can be started and stopped with just the touch of a button. 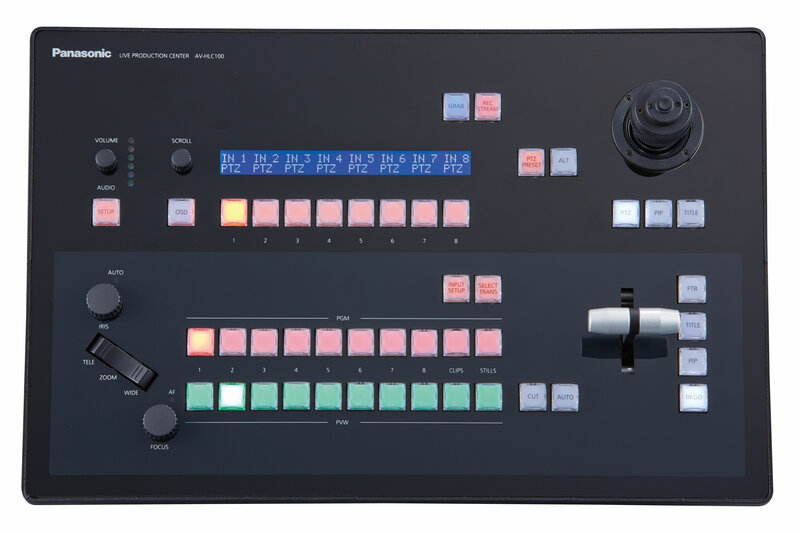 The AV-HLC100 combines a live switcher, remote camera controller and audio mixer in one unit, making it truly an all-in-one switcher. 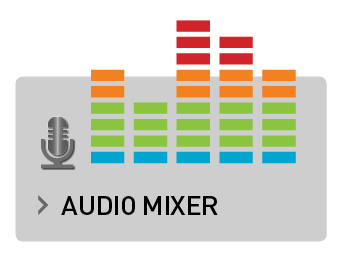 Live audio production for small live musical performances, lectures and presentations can now be done easily with just a single operator, instead of the multiple operators that are usually required. 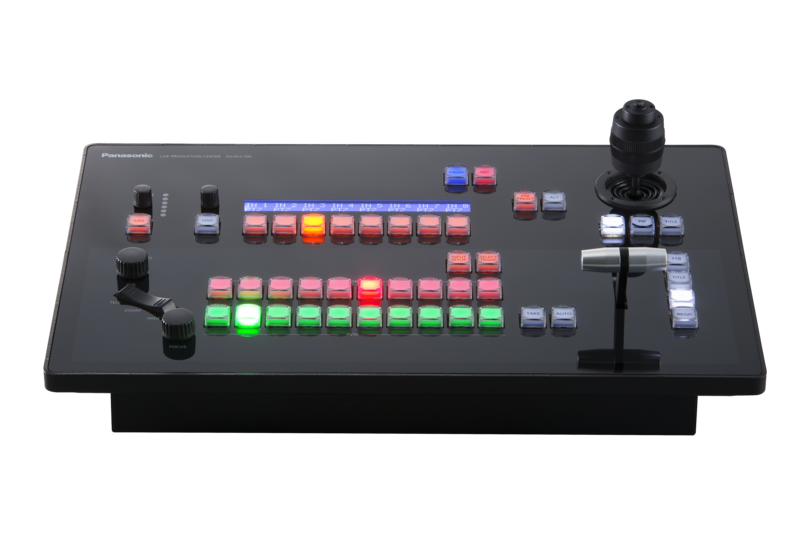 It is also compliant with NDI® and NDI®|HX standards, enabling connection and control of the remote camera to be performed through the same LAN cable with power provided (via a PoE+ hub) for smooth remote shooting. TELE / WIDE zoom can be done with the seesaw switch in the bottom left section of the unit. Detailed camera IRIS and FOCUS adjustment can be performed by individual dials, and position control such as PTZ Camera pan/tilt and on-screen PiP/Title location can be adjusted via the 3D joystick in the top right section of the unit. The AV-HLC100 supports up to 8 total audio input sources via embedded digital audio, analog audio, and microphone audio inputs. 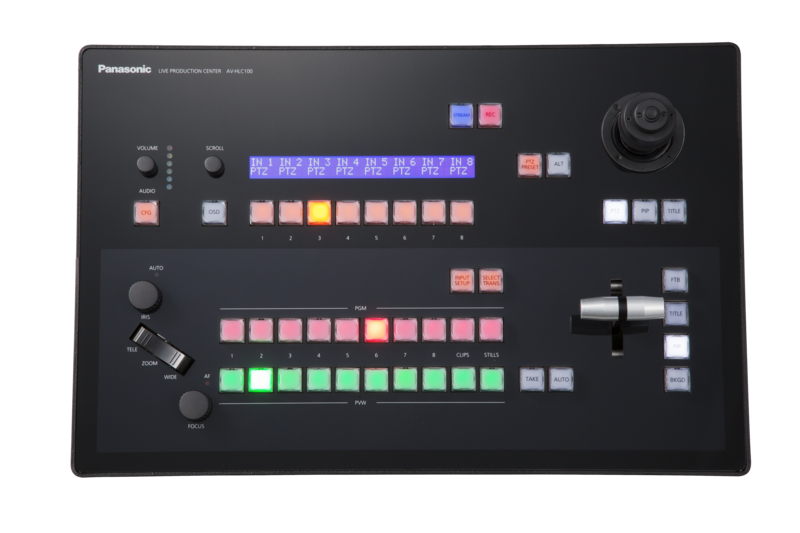 You can select these 8 sources from a selection of 8 x IP inputs, 4 x embedded audio sources, 2 x line input sources and 1 x microphone input source, and assign them to the mixer. These audio sources can be mixed and output to analog audio outputs, headphone output and embedded with video outputs. 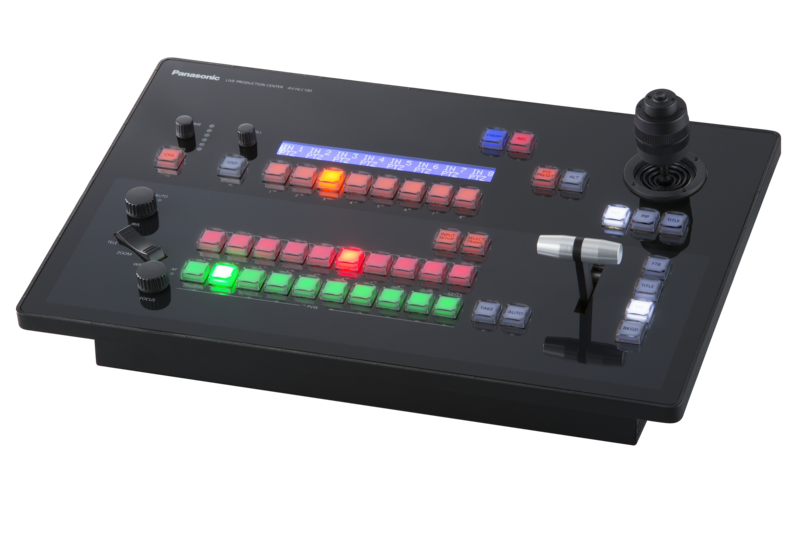 The switcher has a volume knob that can be used to control the audio level, which can be monitored via LED lights on the surface of the unit. Additionally, more intricate audio level adjustments for all sources can be made via the on-screen GUI. 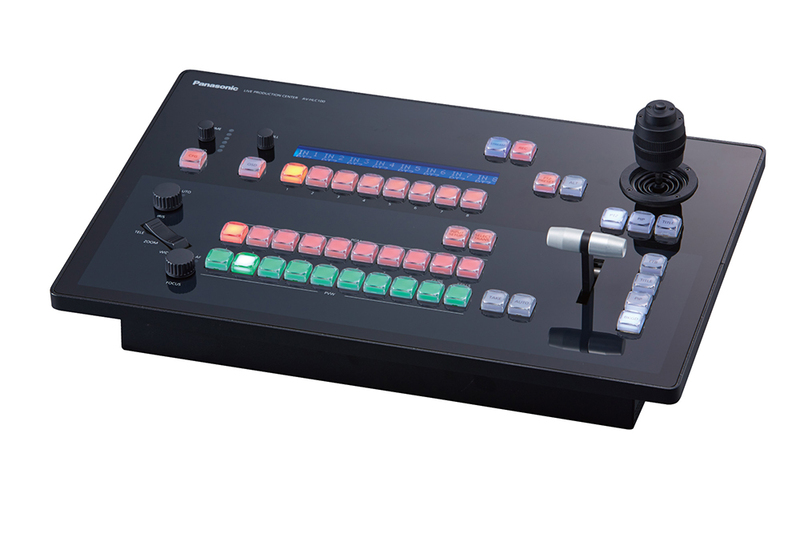 The AV-HLC100 features a wide range of video effects available for quick, professional live productions. With Picture in Picture (PiP), you can overlay another source and resize/reposition this PiP window wherever you want it on the screen. You can also choose from a vast range of over 190 transition patterns, including 3D-DVE to easily add effects to your show. 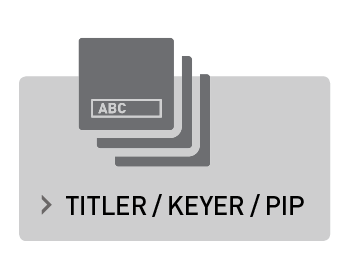 Adding titles is also super simple, with a library of design templates where text attributes such as font and color can be edited and placed on-screen. 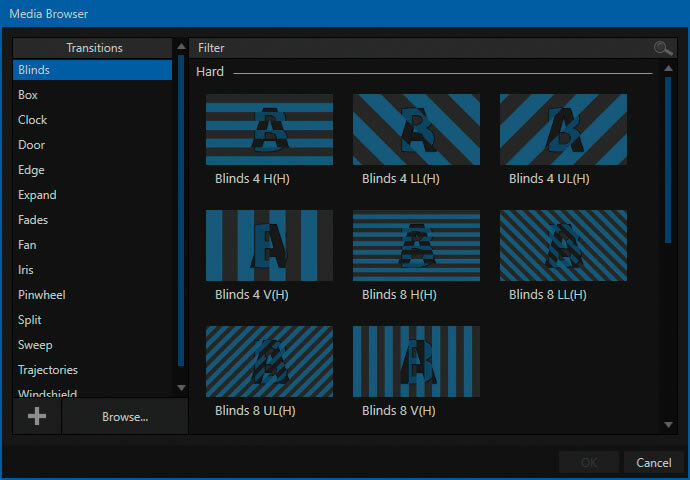 You can also queue up to 8 predesigned titles as presets for a smooth workflow during livestreaming. The AV-HLC100 also features a clips & stills media player which allows for inserting videos and still images as sources, along with a variety of file formats Windows® supports (please note that some formats are not supported.) Autoplay can be set to automatically play multiple sources that have been prepared in advance. The AV-HLC100 supports a wide range of video formats including 3G-SDI video in 1080/59.94p and 1080/50p, and enables cross-conversion between 1080p/1080i and 720p. 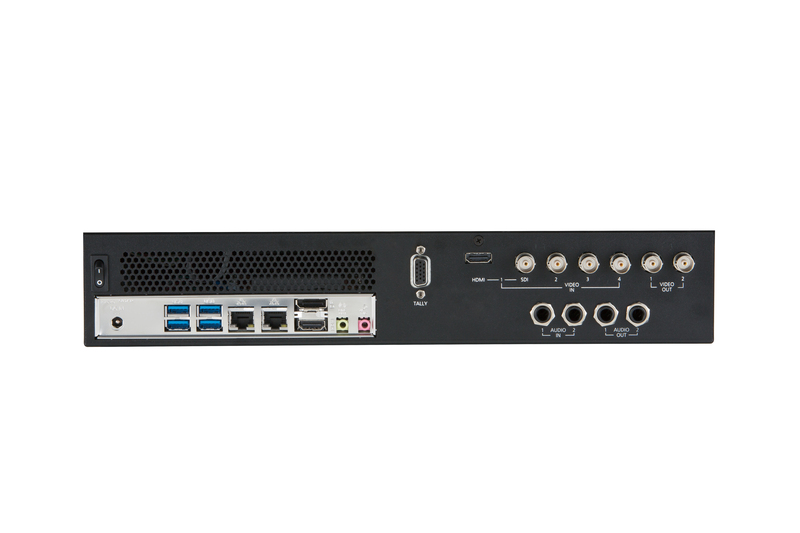 SDI x 4 or SDI x 3 / HDMI x 1 can be selected, and it also has 8ch of IP inputs, so that a system can be configured to match the production environment. It is also compliant with NDI® and NDI®|HX, which enables high-resolution videos to be encoded and transferred in real time. This also means that up to 8 of our Professional PTZ Integrated robotic cameras* can be connected with a single LAN cable, without external IP decoders, and automatically link to the AV-HLC100. This enables video and audio transfer, PTZ camera control, camera power and tally lights all via a single cable, allowing for quick set-up and simplified cable management. 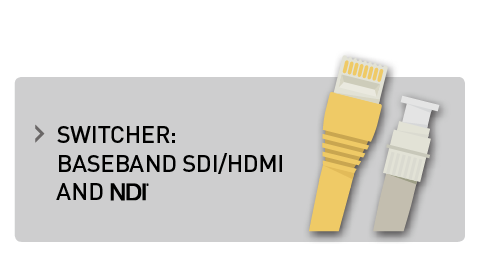 Supported video outputs include HDMI x 1, 3G-SDI x 2, RTMP streaming x 1 & NDI® x 1. The AV-HLC100 can use Skype TX as one of the sources, which enables broadcast-quality video communication. 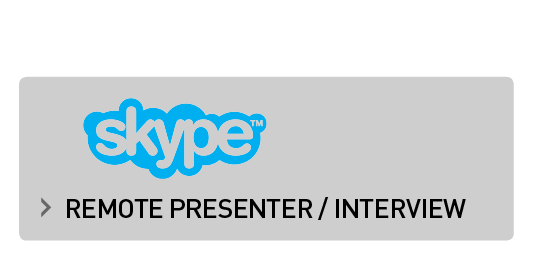 Footage sent by Skype-based video channels from remote locations can be directly incorporated during live shows and can be used for interviews or on-location broadcasts, providing an engaging way to bring in guests from all over the world into your live events, lectures, webinars, and presentations. Les formats de sortie pris en charge incluent les formats 1080/59.94p et 50p. Une fonction de conversion croisée (entre 1080 et 720) est également disponible. L'appareil garantit une transmission flexible, étant donné qu'il est possible de mélanger des signaux audio incorporés, une entrée ligne et une entrée micro et de les ajouter à la vidéo. In addition, supported network protocol the NDI®, RTSP (direct input of the IP video from Panasonic PTZ cameras) and the RTMP (direct transmission to live streaming services such as YouTube Live). High-production value can be accomplished even in situations with a limited number of operators and with limited staff training. 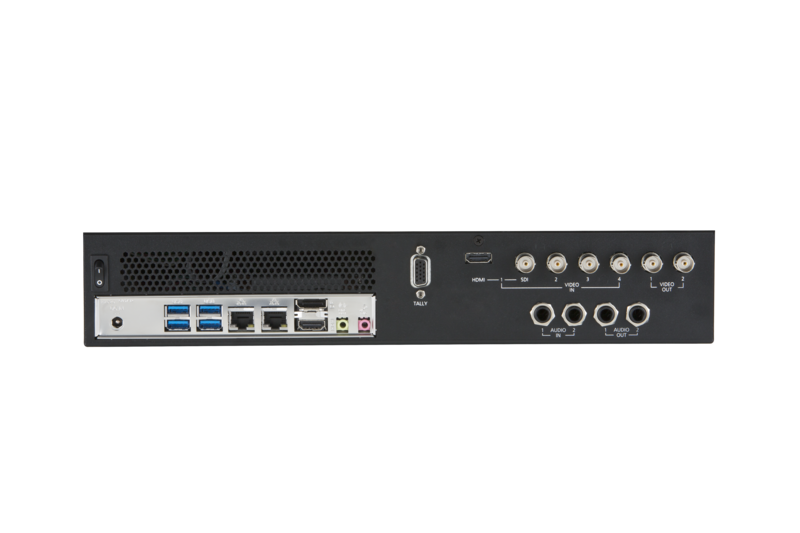 NDI®: Network Device Interface, a technology of NewTek, Inc.
Une nouvelle classe de caméras PTZ avec 4K 60p/50p donnant accès à de nouvelles opportunités dans la production vidéo. Cliquez ici pour plus d’informations. Une nouvelle classe de caméras PTZ avec 4K 50p donnant accès à de nouvelles opportunités dans la production vidéo. Cliquez ici pour plus d’informations.